Through the generous support of our contributors, the "Make It Real!" Ministry is able to offer you the following resources free. Please click on the title you would like to receive and be sure to designate a mailing address. Q: Once Saved Always Saved? Q: Does the Bible Really Condemn Homosexuality? Q: How Can a Person Know if They are in Love? Q: What Part Does Baptism Play in a Person's Salvation? * Interested in scheduling a seminar with Sonny Childs? Simply fill out this form and someone will respond to you as soon as possible. all the new pages on HeyBrotherSonny.com, the minute they go up (special postings, too). Get the Christian Advantage Blog at your favorite RSS feed reader. See "Recent Articles" below and sign-up today! Was water baptism replaced with Holy Spirit baptism? Was water baptism replaced with Spirit baptism? 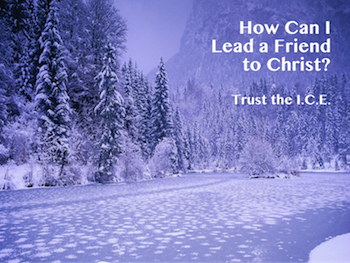 How Can I Lead a Friend to Christ? How Can I Lead a Friend to Christ? - During the Lord’s final instructions before ascending back into Heaven, Jesus issued a three-part assignment - go, make disciples/teach, and baptize (Matthew 28). Copyright © 2013-2019 HeyBrotherSonny.com. All rights reserved.